I Must Have That Man (written by Dorothy Fields and Jim McHugh) Accompanied by MIke Mosiello (trumpet), Jimmy Lytell (clarinet); Andy Sannella (alto saxophone and steel guitar); Rube Bloom (piano) Recorded July 24, 1928. 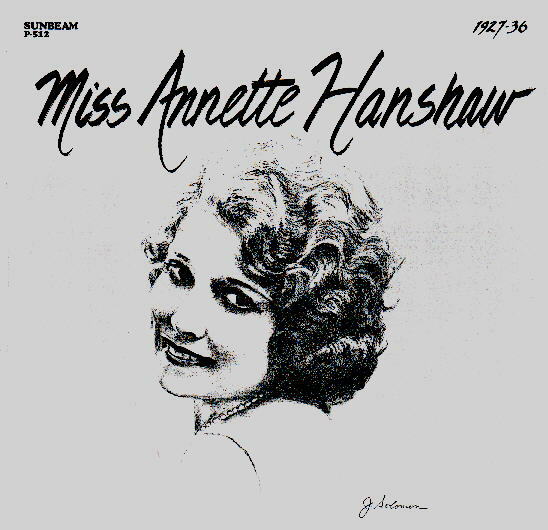 Note: On Parlophone Label Annette is listed as Janet Shaw! Accompanied by Muggsy Spanier (cornet); unknown clarinet, tenor saxophone, violin, guitar and string base. Miss Annabelle Lee (written by Sidney Clare-Lew Pollack) Annette accompanies herself on ukulele and Phil Wall is on "piana"! (Oscar Hammerstein II-Sigmund Romberg) Accompanied by MIke Mosiello (trumpet), Ben Selvin (violin); Andy Sannella (alto saxophone and steel guitar); Rube Bloom (piano) Recordeded July 24, 1928.
written by Pinky Tomlin-C. Poe-Jimmie Brier-E. Hatch Accompanied by The Five H's Frank Hanshaw, leader; Sal Pace (alto saxophone-clarinet); Emile Palucci (bass); unknown piano; trumpet, vibes. Private acetate recording made at Edwin Strong Studios, Manhatten, late 1936.